Animals in the wild have so many fascinating behaviors that we can only begin to understand. Sometimes pictures surface and we're not really sure what's happening - but we make our best guess, and it's beautiful regardless. A photograph is making the rounds of a butterfly perched gently on a turtle's eye - and people think the butterfly might actually be drinking the turtle's tears. 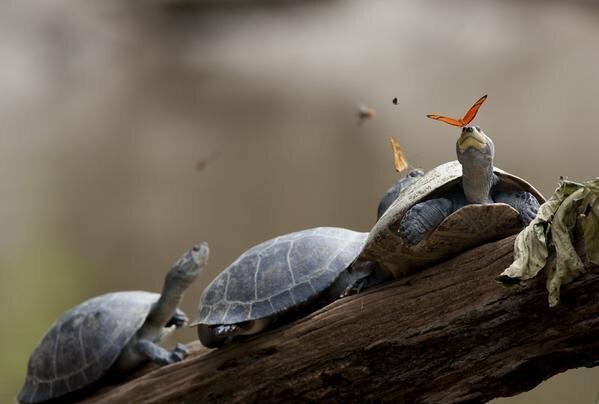 There is indeed a butterfly in the Amazon who drinks the tears of turtles, and that could very well be what's happening in this picture. There are also butterflies who drink crocodile tears. Butterflies drink tears of other animals for the nutrients, and are mainly looking for salt, as sodium can be hard to find from other sources. It is such a beautiful reminder of how amazing animals are, and how well they work together to live their lives.